eozyo @ blogger.com: [Surviving Sweden] New Series Coming Up! Now, take that, add that you live in Sweden and most of the relevant information is in a language you do not quite master yet— even though instructions and solutions are often quiet easy—and online information relies on bits and pieces of information, from comments and experiences of other people, however, little or no sources are provided. Consequently, I have taken on the endeavor of putting together a comprehensive guide with information, tips, clarifications, and solutions to ordinary life issues that we, newcomers, face when start getting installed in Sweden. Well, during the my stay in Sweden I confronted many situations in which beforehand knowledge would have been a great time saver. Swedish society works like a well-oiled machine, the problem for us, foreigners, is that that we are not used to their processes and the way things work. For instance, in Sweden, in order to rent an apartment, one just not look into the classifieds and start making phone calls and sending applications. No sir, not in Sweden. In this Scandinavian country, I would say in 95% of the cases, one has to join a public or private housing queue to get a first-hand lease contract. There is no limit in the amount of queues one can join, as long the membership requirements are satisfied. Among the requirements to get a lease, it is the time spent in the queue the heaviest factor to rank applicants. Hence, the longer one stays in the queue, the higher the chances to get an apartment. You just need to join a queue as fast as you arrive to Sweden—or even perhaps from your country of origin—and start accumulating time, easy peasy, right? Sorry, amigo, no can do. In order to join a queue, with some very limited exceptions, you are required to have a Swedish personal number (personnummer). 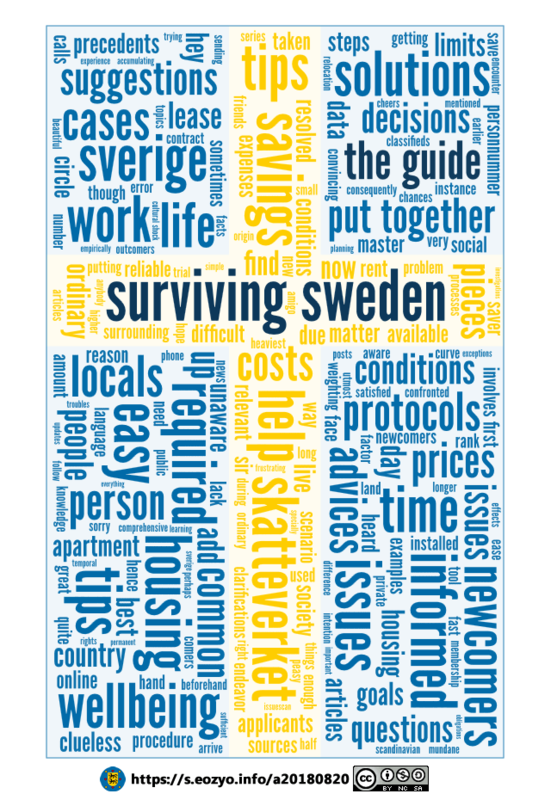 But more about the housing question and, what will be your most important tool in Sweden, the personnummer will be topics for future posts. As mentioned earlier, the Swedish society works like a well-oiled machine, and the intention of this series of articles have the goal to provide future new comers with facts that will help them to take an informed decision, and to be aware of the—many—frustrating situations to encounter in this rather beautiful land. Small tips like on these rather mundane issues can make a world of difference, specially for people who may be planning temporal or permanent relocation to Sverige. There is a learning curve for everything, and if my own experience can help anybody else to ease the effects of the cultural shock, I will do my utmost to provide the best information in a simple, easy to follow guide to solve day-to-day issues in Swedish life. So, Cheers! To the future, in hope that this guide will help you to save you at least half the time I spent trying to solve my issues with non-sufficient information, empirically, by trial and error, or by investigating and piecing information together. New series of articles talking about common troubles and issues after relocating to Sweden. A guide with steps and reliable sources to put you on the right track to a solution to adverse situations presented during your first months in Sweden.